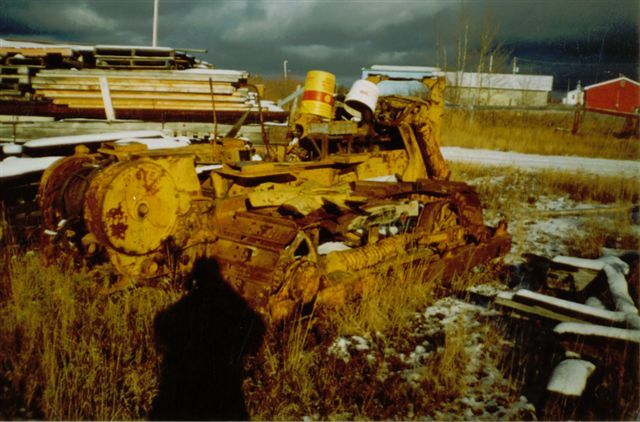 In this issue of the Cat Train Newsletter, I will be telling you about the complete tear down of the D6 9U known as "THE HOOD" to see what damage was done by 3 years in a watery grave. 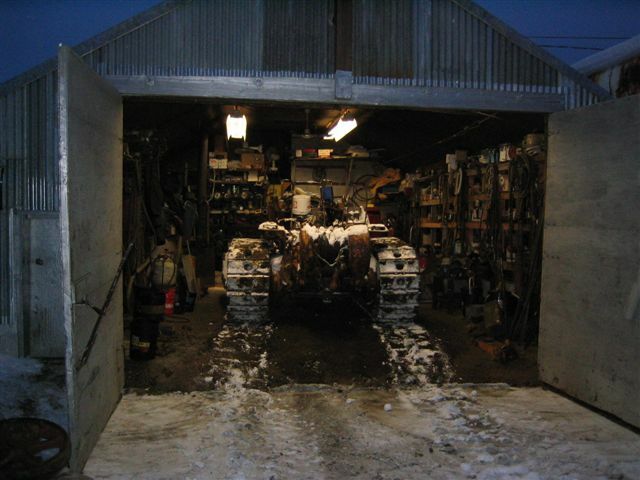 In February 2005, "THE HOOD" was pushed into my little shop using a borrowed fancy new Caterpillar IT-28G loader, only 50 years difference between the two machines. With "THE HOOD" in the shop and the wood stove pumping out the heat, it was neat to see the snow and ice melting off "THE HOOD". Slowly the melting snow and ice revealed the damage done by 3 years in the watery grave. When I removed the oil pan to get all the swamp mud from the bottom of the pan, I was amazed at how the bottom of the engine had no rust what so ever. The crank and connecting rods were like brand new and the connecting rods were not bent. So this meant that the operator had shut off the engine before the machine "took on" water, unlike the "BISMARK" with his bent connecting rods because he was running went he went down under water. I continued to remove the covers and clean out anywhere that water and mud might be trapped in the works of this machine. Even the fuel tank was full of mud since fuel is lighter than water. When the fuel floated out of the fuel tank, water and mud replaced the space where the fuel was. So what a time I had trying to get the mud out of the fuel tank. I ended up cutting holes in the fuel tank to get the mud out. With the big holes in the fuel tank I was able to see that swamp mud is totally different then southern mud. The fuel tank was shiny clean as if there was no mud at all or had ever been in there. This mud didn't rust the tank but helped preserve it. After the long month of February, I was ready for a test run with "THE HOOD". Everything was running fine and off I went into the town of Lynn Lake, Mb. Why not just go and terrorize the town with a cat that spent 3 years under water! 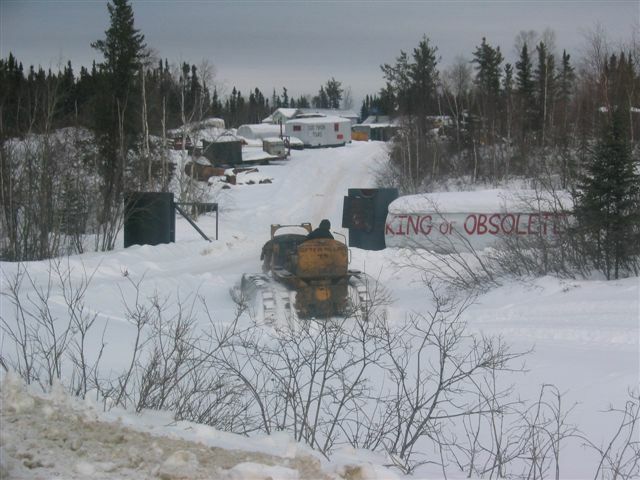 I thought it would be easier to tow "THE HOOD" back to the KINGDOM on the hard packed snow streets than through the deep snow in the bush. With a test run of success, I was now ready to start modifing "THE HOOD" to make it a customized winter freighting cat of the Great White North. First thing I like to do to a cat is make it that there is lots of engine heat going to the operator's area, but on these D6 9U's the hood area in front of the operator's area is very narrow. 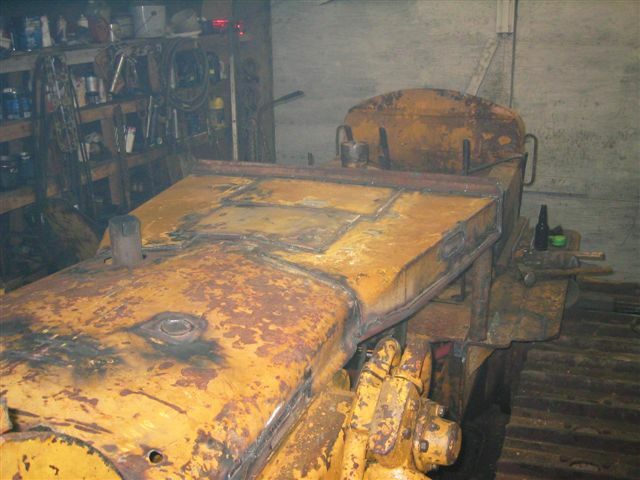 Caterpillar designed the hood sheet metal to be wide at the radiator, then narrow down at the operator area, so that the operator could see forward. But in the Great White North, I need heat more then I need to see forward! Plus the fact that the original hood sheet metal got ran over flat by a loader or an elephant sat on it, you can decide which. So now I began to modify the hood sheet metal to make is so that lots of heat comes back to the operator's area, and of course, I'm using recycled metal! Can't afford any new fancy material for this project due to the fact we have no budget like all my other projects. When I finished the "new style" sheet metal hood for "THE HOOD", it was huge! You needed two men and a boy to lift the sheet metal hood on and off "THE HOOD". When my buddy's stopped by to see my projects in the little shop, they all agreed that the sheet metal hood was definitely appropriate for the D6 9U known as "THE HOOD". "THE HOOD'S" very first freighting job was to Tate Island Lodge on Reindeer lake, the cat performed rather well until he lost power to the right side track. I tell more on this in the next issue of the Cat Train Newsletter since I'm writing these issues while "sitting out" a MARCH snow storm on Reindeer Lake. FOUND A PICTURE OF "THE HOOD" IN ILFORD IN OCTOBER 2003. BACK TO PAGE ONE OF "THE HOOD"
NEXT PAGE ON "THE HOOD"